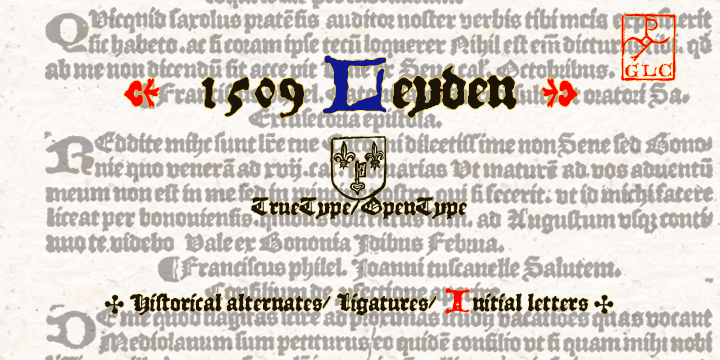 This ancient font as per its name was first used in 1509 in a Dutch town then known as Leyden for printing Francesco Filfelo’s “Breviores elegantioresque epistolae” by Jan Seversz. 1509 Leyden had covered almost one complete set of small lombardic initials, the complete set of lower case characters except w, Eth , etc. , almost all uppercase ones. This so to say had a rare complete set of historical printing facilitating printing of historical books of those days. Those missing are very well adjusted and added by the GLC. Size of lower case “a” was 2.8mm and that of uppercase was 5mm with the initials having a good clear size of 15mm. Because of clear and picture perfect calligraphy it is used by archaeologist for publishing, even used in websites, presentations and also in certificates because of its decorative looks.